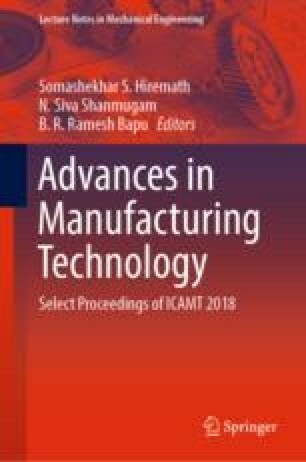 This article deals with the optimization of process parameters in WCEDM of titanium alloy (Ti–6Al–2Sn–4Zr–2Mo). Material removal rate and surface roughness were studied against the wire cut EDM process parameters, namely pulse ON time, pulse OFF time, voltage and wire feed rate. The pulse ON time selected for the experiment was 4, 5, 6 µs, and pulse OFF time is 6, 8, 10 µs. The voltage values selected in the experiment are 50, 65 and 85 V, while wire feed rate used was 2, 4 and 6 m/min. The effect of pulse ON, pulse OFF, voltage and wire feed rate over material removal rate and surface roughness of the machined surface is backed up with scanning electron microscopy (SEM). The contribution of parameters on responses was determined by analysis of variance, and regression models were obtained for material removal rate and surface roughness.